The funny thing about future events is they keep getting closer. Which means that I should be focusing on baking (and freezing) cookies for December delivery to all my neighbours which has apparently become a tradition, and making a whole lotta little Christmas gifts. omigosh the lace. It is so intricate and balanced. Rachel Coopey is a genius! It would have taken me ages and ages to work out so much snaky complication, but now that she's mapped it out it's quite logical to follow and once I got the cuff set up I could follow it without the chart. That will change when I get going with the leg, but for now: yay! Also - there is purple, and there is Evil Purple. Louise has dyed this a lovely shade of purple with hits of white ash and poison blue. I just can't think of a better combination of theme, pattern, and yarn. This is one irresistible project. There is no way I can have these done in time to wear for Halloween. I know that. It would be nice if I could finish them before I open the next Biscotte Club packet on November 1, but obviously. Me, of the two-month socks, making a pair of socks in two weeks filled with Life plus a front yard that needs decorating with leaf bag monsters and a big headless man? 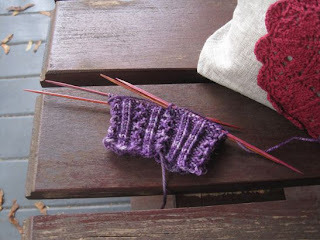 Socks that are knit from an elaborate chart with the occasional cable needle activity and can therefore only be done (by me) from a comfy sofa? Please. Not possible. You gotta have goals, otherwise life would be so boring. Go for it!